Utilizes basic concepts of economics and finance to explain the relationship of the economy to the ecosystem, seeing the ecosystem as imposing biophysical constraints on economic growth. Means of sustainable economic development and sustainable resource use are stressed. Background material and alternative, more efficient, problem-solving approaches are included. Dr. Tony Prato is professor of resource economics and management, and director of the Center for Agricultural, Resource and Environmental Systems at the University of Missouri-Columbia. He has written extensively on the assessment and management of natural resources. Prato is the recipient of numerous awards and distinctions and has taught and/or conducted research in the United States, the People's Republic of China, Thailand, New Zealand and Australia. His experience in the field includes service with the US Department of Energy and the US Department of Agriculture. 1. Importance of Narural Resources and Environment. 2. Economic and Financial Concepts in Resource Management. 3. Historical Views of Natural and Environmental Resource. 5. Property Rights and Externalities. 9. 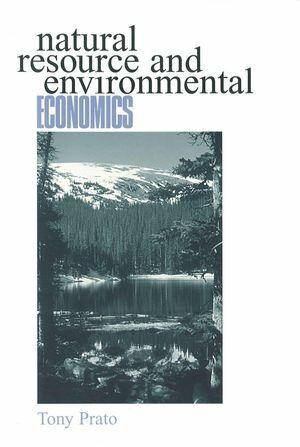 Economics of Environmental Pollution. 10. Natural and Environmental Resource Accounting. 11. Benefit-Cost Analysis of Resource Investments. 12. Nonmarket Valuation of Natural and Environmental Resources.